This series of posts will celebrate the many contributions of the great supporting actors who worked for the Columbia Shorts Dept. and especially with the Three Stooges. Many of these players were comedy veterans going back to the silent studios of Keystone and Hal Roach; others were relative newcomers who got their chance to shine at Columbia. One such player was Emil Sitka (1914-98), a talented and versatile actor who graced many Columbia shorts and became one of the Stooges' regulars. Emil's first Stooge short, Half Wits Holiday (1947) was Curly's last and he worked with Shemp, Joe Besser and Joe DeRita and just missed becoming a member of the team in the 1970s. (Moe and Larry, of course, were the constants).The photo shows the "Stooges that almost were"-Moe, Joe DeRita and Emil in 1975. Emil was adept at a variety of roles. He could play character parts of his own age and then turn around and play mad scientists and old codgers with make-up and wavy white hair. He also had a great elastic voice that put over his various characters. Emil (of Lithuanian descent) grew up in the Pittsburgh area of Pennsylvania. He came from a catholic backround and got his early acting experience in local passion plays. During the depression he worked his way to Los Angeles where he worked as a laborer. He continued his acting in local theatre productions and got rave reviews for his performances. A talent scout from Columbia saw him in such a production and recommended him to Jules White, head of the Columbia shorts. Emil's "audition" with White consisted of his reading some lines from a beat up Charley Chase script. Despite the rather unplanned reading Emil scored points with White and in 1946 he debuted in a Vera Vague comedy, Hiss and Yell. Although best known for his Stooge roles, Emil worked in most of the Columbia comedy series including Hugh Herbert, Andy Clyde, Shemp Howard, Schilling and Lane, Vernon and Quillan and all of the Harry Von Zell comedies. (This series although currently unavailable has gotten high marks by comedy fans.) Emil's comedies with these players weren't available for review, so we'll concentrate on his many superior Stooge shorts. Emil's first Stooges short, Half Wit's Holiday, gave him the part of Sneffington the butler. He has some fun byplay with the boys and is a key player in the film's climatic pie fight. He's great as he hands a dowager her drink and gets pasted, politely excusing himself. During the Shemp era (1947-55), Emil really came into his own with many classic roles. Probably his best remembered is as Justice of the Peace, J.M. Benton in Brideless Groom (1947). In the film Moe and Larry try to marry off voice instructor Shemp to collect an inheritance. The only candidate is homely student Fanny Dunklemeir (Dee Green). The boys and Shemp are all set to be married by Emil when a gang of Shemp's previous invitees show up after hearing of Shemp's windfall. A wild brawl ensues with justice Benton on the end of much of the mayhew. The final straw is when Emil gets a bird cage off the head. With his whiny voice, professor glasses and classic line of "hold hands-you lovebirds" Emil almost steals the show from the Stooges (not an easy task). Another 1947 release , All Gummed Up features the first of Emil's many "old codger' roles. He plays Mr. Flint, owner of the drug store where the boys work. The boys come up with a miracle serum that makes old people young. Flint goes wild when he sees what the drug does to wife Christine McIntyre (first lady of Stoogedom). The ensuing results with Emil trying the same serum are predictably hilarious. Although only in his thirties at the time, Emil's voice and makeup make him a perfect"codger", a role he would repeat many times. (By the way-this film was remade as Bubble Trouble(1953) a common practice at Columbia). 1949 saw Emil in two of his classic roles. Who Done It? is one of the best Shemp comedies. The boys play detectives summoned to the Goodrich estate. Mr. Goodrich (Emil) has dissapeared and his neice and a group of crooks are out to get his money. The film is a classic Stooge "scare" comedy and Emil as "Old Man Goodrich" has some hilarious moments. With his wavy white hair and whiny voice, Emil makes the perfect "old man". His reappearance later in the film as a Corpus is a hoot. Also neat is his regaling to the Stooges of his "torture"-they tied me to a chair and made me listen to singing commercials! Vagabond Loafers has the boys as plumbers working at a swanky part hostee by the Norfleets (Emil and Symona Boniface-one of the Stooges' favorite dowagers). Art theives Kenneth MacDonald and Christine McIntyre try to steal the Norfleets' Van Brocklin painting only to be foiled by the Stooges. Emil is in the middle of much mayhem by the boys but somehow keeps a straight face thruout. The film is a reworking of A Plumbing We Will Go , a classic Curly short. It was in turn remade as Scheming Schemers(1956) -(see our post "Case of the Fake Shemp). With the many Stooge remakes in the 50s ,Emil was frequently called back to shoot some new scenes and even asked to dye his hair or lose a few pounds to match earlier stock footage. Another 1949 release, Fuelin' Around featured Emil in another "mad scientist " role. He played Prof. Sneed, inventor of a super rocket fuel. Larry is mistaken for him ("that magnificent head of hair") and captured by spies from the State of Anemia. Emil's role is pretty straight but it's always fun to see him in professor/scientist mode. 1950's Three Hams on Rye had Emil in a terrific character part as B.K. Doaks, a very off Broadway producer who employs the Stooges as stagehands and part time actors. His reactions to the boys' antics is classic. When the Stooges seem to ruin the play's finale ,it turns out to be a comedic success and Emil is lauded for his genius as a talent scout! Scrambled Brains (1951) gave Emil a tried and true bit as a doctor (complete with coke bottle glasses) examining Shemp and hearing a "ma-ma" doll every time he uses his stethescope on Shemp! Hula-La-La (1951-see our earlier post) has Emil as studio boss Mr. Baines who sends the boys to a South Sea island to give the natives dance lessons. He tells the boys not to fall down on the job and gives us the expected pratfall when he misses his chair! Gents in a Jam (1952) has one of Emil's greatest performances showing his mastery of verbal and physical humor. He plays Shemp's wealthy Uncle Phineas (back to the old man makeup) who has come for a visit. The boys think Uncle Phineas will bail them out of their back rent. Along the way they get caught up with a new neighbor, strongman Rocky Dugan (Mickey Simpson) and his wife. When the wife winds up in an uncompromising situation the slapstick reaches it's nadir! At one point Emil is bumped by all the Stooges, Rocky and for good measure gets Mrs. Dugan's high heel in the kisser! It turns out that the boys' mean landlady is Phineas' old sweetheart and so goes the boys' windfall and their health as Rocky tears out after them! Emil's whiny voice and great physical bumps are highlights of a classic short. These are some of Emil's standout shorts. He had many small character parts and cameos during the Stooge series. Being a consumate pro he made the best of any part including reporters, butlers, chefs, military men or just friends of the boys. As we mentioned, the constant use of stock footage gave Emil repeat showings in Stooge films along with new sequences in the remakes. Stone Age Romeos(1955) was a clever remake of I'm a Monkey's Uncle (1948) with the boys as cavemen. In the new footage the boys show museum curator B. Bopper (Emil) their footage of "early man". (the scenes from the earlier film). The new scenes are clever and match up nicely with the original. During his time at Columbia Emil also did freelance work in other films. He pops up in several Bowery Boys films of the 50s, usually in small cameos. Director Ed Bernds and writer Elwood Ullman worked on quite a few of the Bowery Boys films of the period using many Stooge-like situations and gags. In Private Eyes (1953) sequences from the Stooges' Monkey Businessmen (1946) are used. A sanitarium scene with Emil as a wheelchair ridden patient is reworked. Emil's short but sweet spot is a highlight of the film. When Shemp Howard passed on in 1955, his place was taken by veteran comic Joe Besser. Emil continued with the series in a variety of amusing roles.His meatiest role of the period was in Outer Space Jitters (1957) once again reprising his mad scientist role. As Prof. Jones ,Emil and the boys land on the planet Zunev and contend with the evil Grand Zilch (Gene Roth) , High Mucky Muck (Phil VanZandt) and Goon (a pre- Bonanza Dan Blocker). This is one of the best of the Besser series. (see our separate post on the film). When the Stooges shorts ended in 1958 , Emil continued working with the boys in features and other projects. Joe DeRita had come aboard as third Stooge. He was a Burlesque veteran who had a short-lived series of his own at Columbia. Emil can be seen in The Three Stooges meet Hercules (1962) in two cameos , in Stooges Go Around the World in a Daze (1963) as a butler and The Outlaws is Coming (1965) in three roles. His biggest role was in 3 Stooges in Orbit (1962) reprising his mad scientist role as Prof. Danforth. Much of the earlier footage was taken from a TV pilot titled 3 Stooges Scrapbook with Emil in the same role. His wide eyed, whiny voiced professor was hilarious as ever and he develops a cartoon technique for the boys. Speaking of cartoons, in 1965 the Stooges starred in their own cartoon series featuring their own voices and also appearing in 40 live action wrap arounds. These segments usually reprised old tried and true routines and Emil popped up in several as the boys' foil. The last Stooge film, Kook's Tour (1970) featured the boys as retired Stooges enjoying a vacation. Emil appeared via stock footage (from In a Daze) in the film's prologue. On a personal note, Emil was married to Donna Driscoll from the 1940s to the 60s. He remarried in the 70s to longtime girlfriend Edith Weber who died in 1981. Emil had 4 daughters and 2 sons. Despite his success as an actor, he always worked a daytime job.Besides his work with Columbia and the Stooges he appeared in many feature films and TV shows from the 50s to 1970. When Larry Fine took a stroke during the filming of Kook's Tour it looked like the Stooges' amazing run had come to an end. However in the early 70s an independant film project wanted the Stooges for a guest spot. 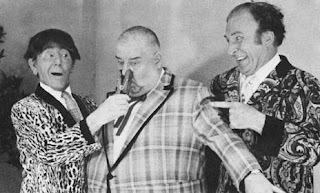 With Larry's blessing, Emil was recruited to be the "3rd Stooge". This project quickly fizzled out but in 1975 another independent comedy called Blazing Stewardesses was produced with a role for this new Stooge combination. Emil was to play Larry's brother Harry and Emil spoke of him as being "consientious to the point of rediculousness." Promo pictures were shot of Moe, Joe and "Harry" (see cover shot) but that was as far as things got. Moe soon took ill and eventually passed on.- the Stooges' roles went to the Ritz Bros.(Larry died in Jan.1975 with Moe following him in May). It would have been fun to see Emil as a Stooge with his years of experience with the team and as a comic actor, I'm sure he would have made a great Stooge. Emil kept busy in his later years, making many appearances at Stooge conventions and on several Stooge TV tributes .In 1986 he wrote the forward to the exellent reference book, The Columbia Comedy Shorts by Ted Okuda and Ed Watz.This book is must reading for fans of the Stooges and Columbia comedies.He also appeared in a 1986 comedy, The XYZ Murders.His last film was The Nutt House in 1992. In June of 1997 Emil suffered a stroke and passed on in Jan. 1998. On his gravestone read his most famous line- "Hold Hands, You Lovebirds". Emil's son Saxon has an exellent website at emilsitka.com , another good site is The Fourth Stooge. All of his work with the Stooges is available on the Sony Three Stooges collection (Vol. 5-8). Here's hoping that his non-Stooge Columbia shorts will surface. What I've seen of the other Columbia series are wonderful and deserve to be enjoyed. We hope this post will bring much overdue appreciation to this comic genius. Till next time- Keep Stooging!